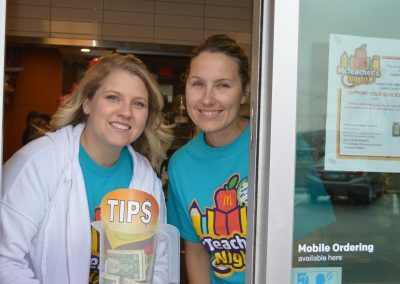 Over fifteen teachers from CCSD21, volunteered behind the counter on Wednesday, March 20th, at the Arlington Heights McDonald’s located on Dundee Rd., where they served students and their families in a fundraiser for Cooper Middle School. Mr. Robert Gurney, Principal, Cooper Middle School was at the event the entire night talking with the families, taking pictures with students and working hard at the front counter. 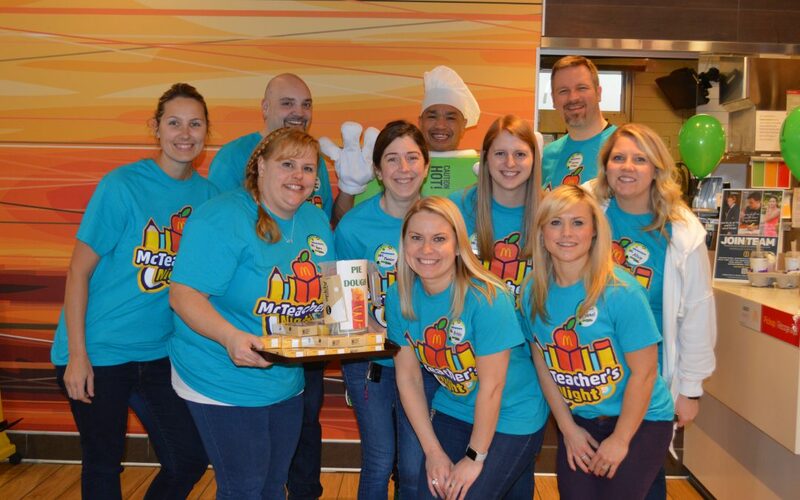 Teacher Paul “Pie” Santos and Becky Goestenkors wore the pie box costume while teachers Horn and Assistant Principal Netzel sold the pies. 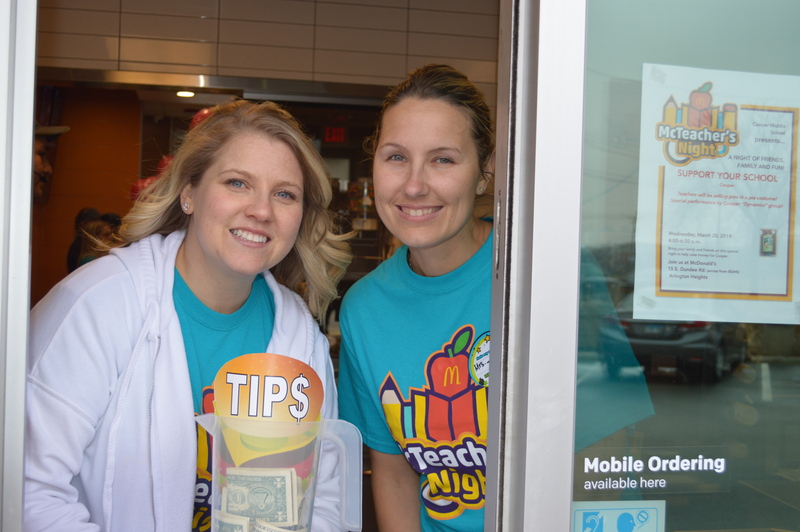 The proceeds from the sale of 104 pies went directly to benefit the PTO, the students, and school. 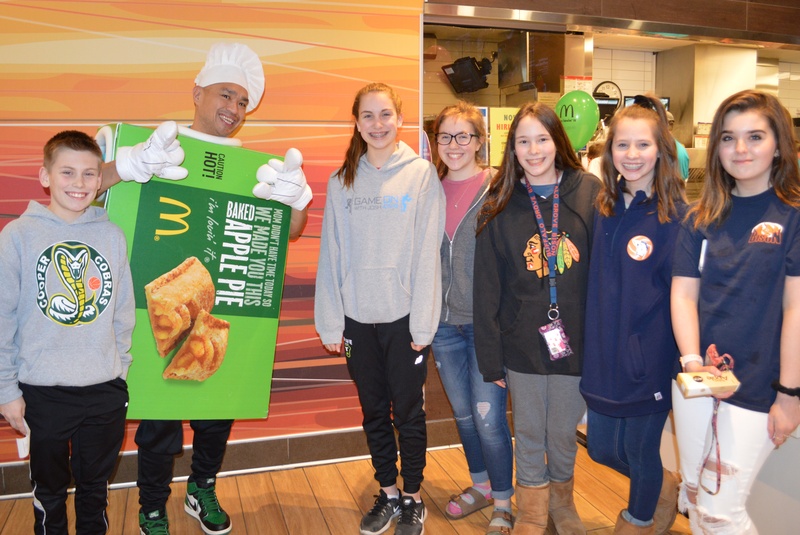 The night was extra special because this was the second McTeacher’s Night for Cooper Middle School. The Cooper Middle School Dynamics Ensemble Lead by Ms. Deetheart gave an amazing performance during the event. 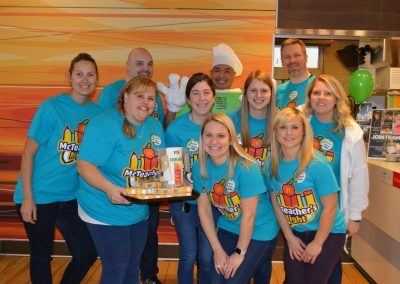 David Bear, Owner- Operator of the Arlington Heights McDonald’s, and the Bear family were delighted to participate in the worthy cause for education and the community. “Principal Gurney and Assistant Principal Netzel and everyone who rolled up their sleeves in support of this event” are the fabric that strengthens our community.” Bear said. The Cooper Middle School McTeacher’s Night was courtesy of the Bear Family Restaurants and McDonald’s Owner-Operator, David Bear. Like us on Facebookand visit our Bear Website. For more information about events provided by the Arlington Heights McDonald’s, please contact Community Relations Director, Julie Travers at julie.travers@comcast.net.